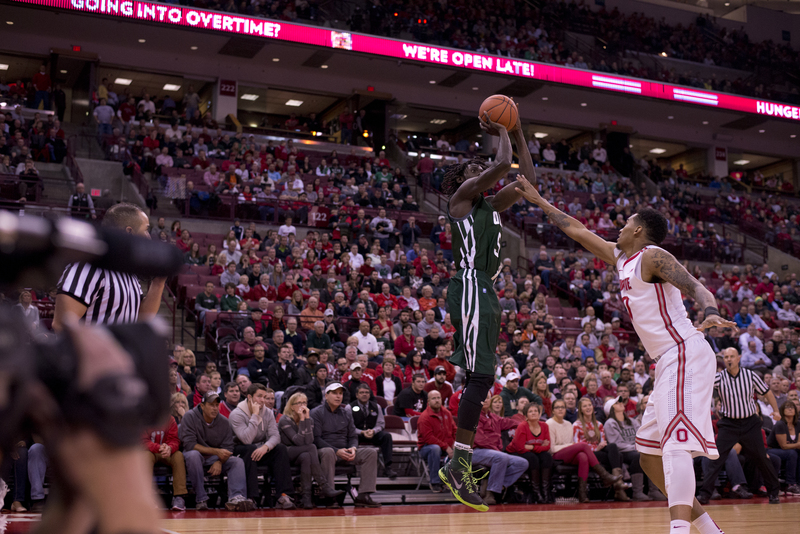 The Ohio men’s basketball team faced an early deficit in front of a raucous crowd at Value City Arena, and even though they cut a 17-point deficit down to five with four minutes remaining in the contest, No. 10 Ohio State proved to be too much to handle. Led by senior floor general Aaron Craft’s 18 points, the Ohio State Buckeyes (2-0) avoided a shocking upset at the hands of the Ohio Bobcats, recording a 79-69 victory Tuesday night. Ohio (1-1) saw their intrastate rivals score the first nine points of the game, and the ‘Cats scored their first basket with more than five minutes gone in the first half. Despite going down 24-7 with 10:11 left until halftime, the Green and White refused to give up. In the second half, the Bobcats went on a 16-6 run to make the score 65-60 with 4:03 left in the contest. But a 3-point bomb from Lenzelle Smith Jr. and five free throw makes from Craft sealed the deal for the Buckeyes. The Bobcats and Buckeyes combined to commit 55 fouls in the game. T.J. Hall, Jon Smith, Treg Setty, Maurice Ndour and Ricardo Johnson all fouled out for Ohio. Taylor thinks the Bobcats will eventually adapt to the way the referees officiate the games. Taylor and senior guard Nick Kellogg led the way with 21 points each for Ohio. Ndour added 10 points and nine rebounds, and Johnson chipped in with nine points and four rebounds. For the Buckeyes, Amir Williams scored 14 points and grabbed 10 rebounds. Sam Thompson chipped in with 12 points, while LaQuinton Ross tallied 10 points and three rebounds. The Buckeyes will now prepare for their first road test of the season before they face off against Marquette on Saturday. Even though they scored the next five points after Ohio State scored the first nine, the Buckeyes were able to extend the lead throughout the first half. An Amedeo Della Valle three, Thompson slam and Craft layup handed Ohio State a 26-12 lead with 7:44 left until halftime. The Buckeyes continued to have a comfortable lead for the remainder of the half. Ross was able to drill a 3 from the wing, and another Thompson dunk coupled with a pair of Craft free throws lifted the Buckeyes to a 40-28 advantage at the break. Ohio shot 9-for-26 in the first half (34.6 percent). The ‘Cats were outrebounded by the Buckeyes, 20-15. The ‘Cats only assisted on two of the nine field goals. In the start of the second half, Ohio State still had firm control on proceedings. Shannon Scott buried a three-pointer, and two Smith Jr. free throws gave the Bucks a 49-36 lead with 15:55 remaining in the contest. Ohio was able to make a dent in the deficit with a little more than five minutes remaining. Kellogg was able to convert a layup, and Taylor completed a three-point play before Ndour’s layup silenced the Buckeyes crowd with four minutes remaining. That was as close as the ‘Cats would come to pulling off the upset. The Bobcats will be hoping to get back to winning ways when they play host to Valparaiso at the Convocation Center on Sunday. Tipoff is set for 2 p.m.